Less than a month now separates fans from the start of Florida State baseball. After an early exit from the NCAA Tournament last season, the Seminoles will look to make a return trip to Omaha in what will be the final season under legendary head coach Mike Martin. Junior infielder Drew Mendoza is FSU’s returning leader in most major statistical offensive categories. Mendoza ranked second only to catcher Cal Raleigh last season in batting average (.313), hits (70) and slugging percentage (.491). Mendoza was third in doubles (17), RBIs (44) , walks (46) and on-base percentage (.440). Mendoza, Raleigh and Mike Salvatore all finished tied for third for FSU last season with 44 runs scored. Senior Steven Wells led the Seminoles with 50 last season followed by Jackson Lueck’s 49. Six different FSU players had one triple last season. Mendoza and Salvatore are the only ones who return. Drew Mendoza and Reese Albert each finished the 2018 season tied for third with seven home runs. Jackson Lueck led the team with 15 blasts, followed by Raleigh with 13. Wells also hit seven long balls last season. Albert’s most memorable home run was a walk-off blast to beat NC State in extra innings. As a junior, Mike Salvatore led the Seminoles with eight stolen bases, which was twice as many as the next closest player — Albert with four. Salvatore’s 12 attempts was more than twice as many as any other Seminole. Despite appearing in just 19 games and making only five starts, only Andrew Karp won more games last season than freshman C.J. Van Eyk. Van Eyk was 7-0 with two saves. The seven wins was tied with starter Cole Sands for the second-most on the team. 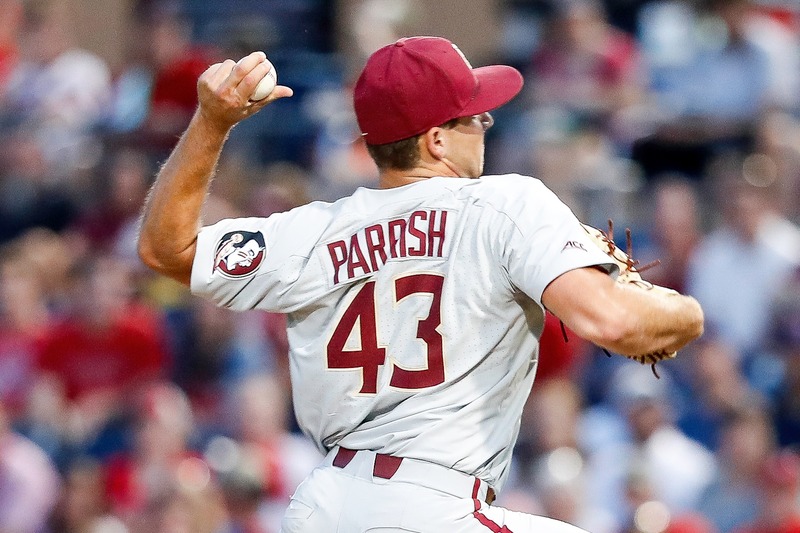 With Tyler Holton on the shelf from opening day forward, lefty Drew Parrish assumed the role of ace for Florida State as a sophomore in 2018. Parrish finished the year with a 2.52 ERA and 128 strikeouts in 107 innings of work — all team-highs. Opposing hitters also managed to bat just .186 against Parrish. Unlike in years past, Florida State didn’t really have a permanent closer. Jonah Scolaro was called upon most out of the FSU bullpen. As a freshman, Scolaro appeared in 27 games and recorded six saves — both team-highs. Three other FSU hurlers finished with two saves. As a freshman last season, Reese Albert posted a .986 fielding percentage. Only first baseman Rhett Aplin fared better. Albert had 72 putouts in 73 chances, committing just one error with one assist. J.C. Flowers is the only returning outfielder for Florida State who had multiple assists last season. Flowers finished second on the team with two outfield assists. Steven Wells led the team with six.